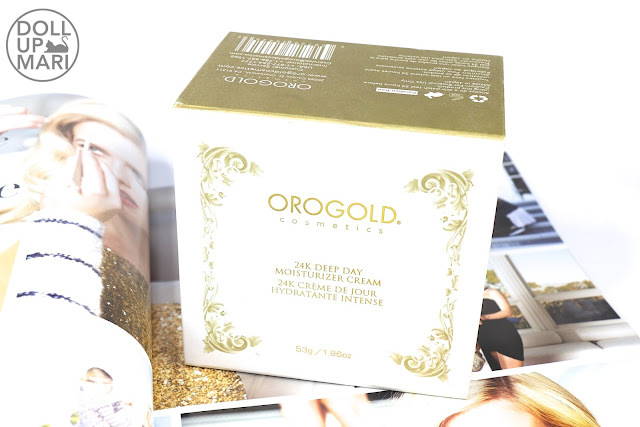 Packaging and Scent: As with anything Orogold, this comes in a big and sturdy box. 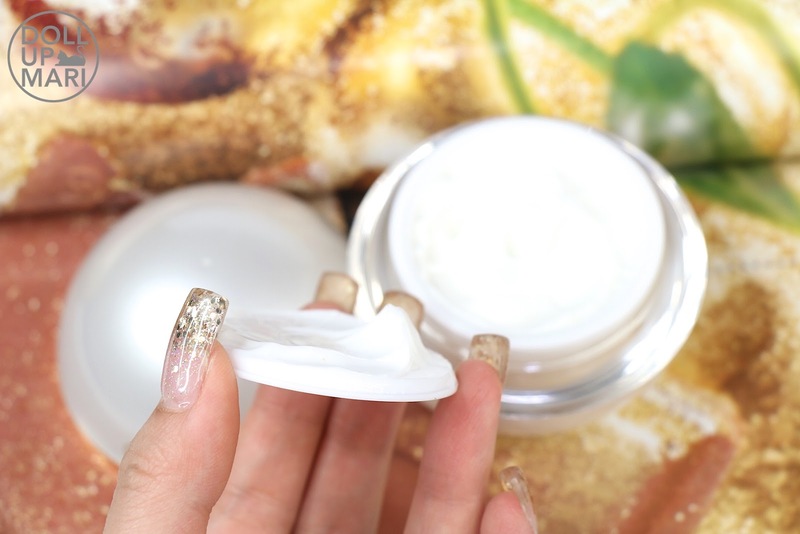 The cream is in a round, pearl-like jar. The packaging is breathtakingly beautiful, but definitely not the kind that would be easy to bring around as it's round and a bit big. You'd really need to transfer this to a smaller jar if you want to bring this with you everyday or if you want to travel with this. As for the scent, it has a warm woodsy fragrance that I can't describe in detail, but it smells luxuriously good. Product Texture: This has a lightweight velvet texture. 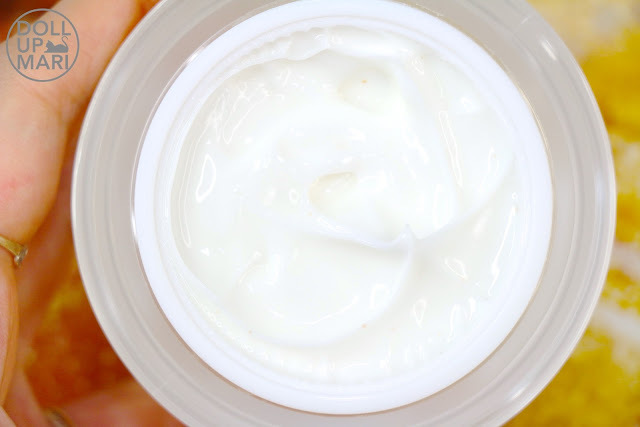 It's not the usual kind of thick cream that we think of when face cream comes to mind. This is actually a bit runny and to some extent, it will flow on its own. Unlike other creams with a velvet texture, this is not powdery. The texture can be likened to what a product between lotion and body butter would be like, a bit runny despite being a bit thick, but emollient and velvety. 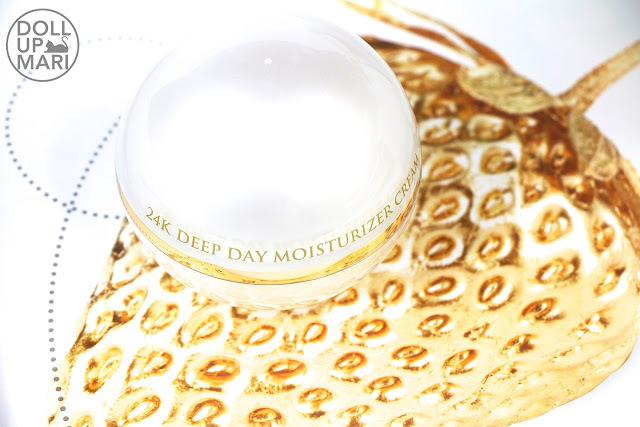 Hydration vs. Oil: For me, this is more on the hydrating side. 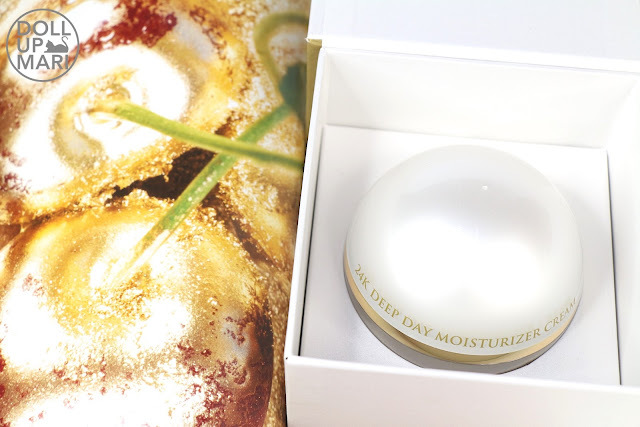 This is not a very oily formulation, although to some extent, it's not oil free per se. It has Vitamin E and Shea Butter, so there's bound to be some oiliness, although to clarify it's not greasiness. While this is a day cream, since it has no SPF anyways, I use it at night and it works perfectly that way for me. 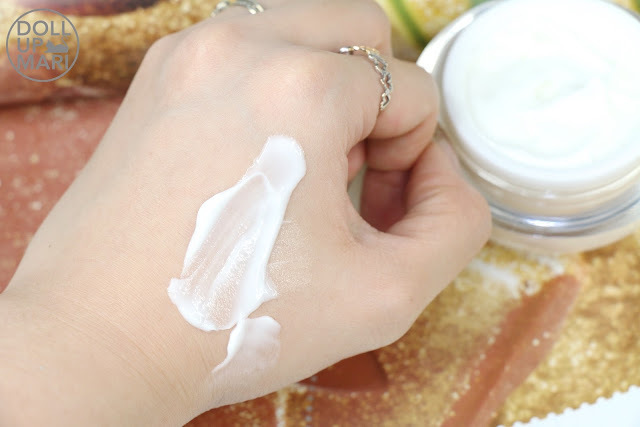 I find many night creams to be too heavy and greasy without really being moisturizing, but this one is lightweight and moisturizing, so it works like a charm. I think this is only going to be optimal as a day cream in colder climates. Here in the Philippines I think we really need moisturizer gels for daytime use, not unless one is going to be in an air conditioned space all day. Skin Texture Refinement: I find this to have good texture refinement. It helps to reduce the size of pores, and I feel that blemishes are reduced with continued usage (at least a month or so). I find that in general, skin feels smooth and supple. This is probably not as good at improving deep craters on the pores, but it provides good enough refinement. 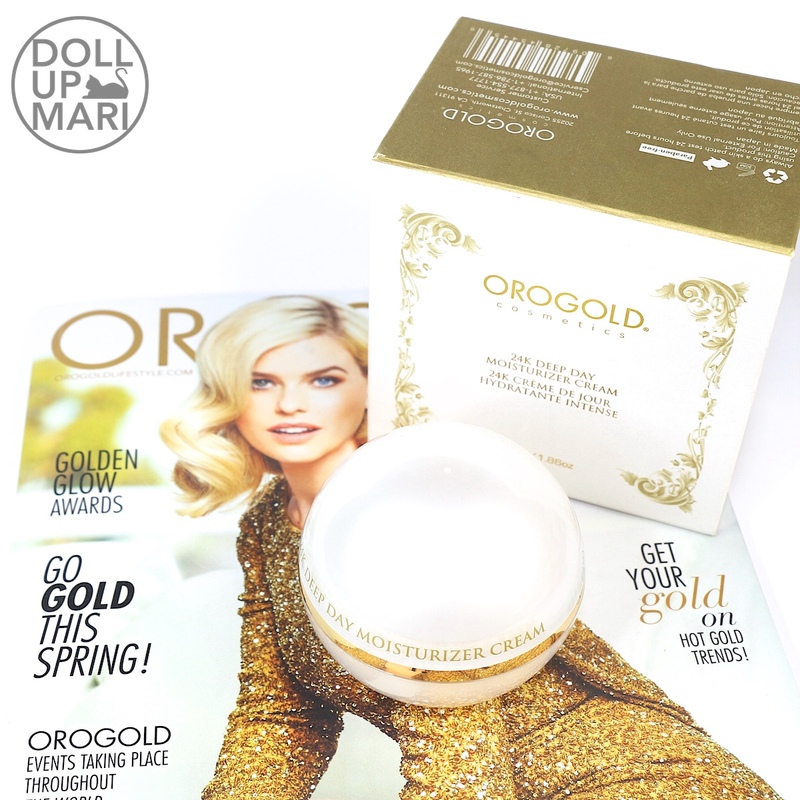 Radiance Boost: Indeed, there is something about the gold flakes in this as this really gives a good glow. It's hard to capture it in photos, but in real life I really do feel that I have this special glow thanks to this cream. As with all their other products, skin is crystal clear and radiant. 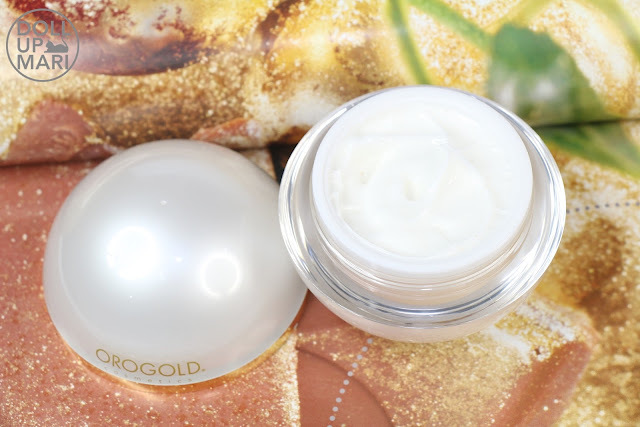 You'll literally look a million bucks with this cream. Value For Money: As per the last list I got, this is Php6100 for 53g of product. It's of course really high end pricing. I'm realistic that this is something that will not be everyone's cup of tea due to the pricing. After about 2 months, I'm just at about 1/6 or 1/5 into the jar, so I'm forecasting that this can last about 7-8 months with nightly use. Amount wise, this is obviously 5-6x the price of other creams, so I'm realistic too that this amount of money can buy several jars of another brand. But this cream really just has the X factor to make you look like a star. For the X factor part, I do think that there are merits to the pricing. Overall Feedback: This has been a luxurious part of my nighttime skincare routine thus far, even though it's a day cream. The lightweight but velvety and luxurious texture makes it perfect for the Philippine heat. I love how this product can be so hydrating without being greasy. To add, there really is an unexplainable glow that you get whenever you use this product. This really just has the X-factor. The pricing is the only "hurdle" I see with this product, because I'd highly recommend this to anyone. Okaaay now that that's done, here are the photos! And this is how the product looks like inside its box. See, it looks like a pretty pearl in a shell! And as I've described, this has a velvety but lightweight texture. If you'll look closely, the tiny little specks in the cream are crushed Italian gold flakes! This has definitely been a dream to use. The fragrance is divine, and the texture works so well. I also get a goddess like glow that really is unique to this cream. If you're feeling fancy today, try this! Do they have a sample size? They don't have samples but you can try it in store!